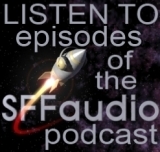 We forgot to mention that this short review is part of the 7th Anniversary SFFaudio Reviewapalooza! Those responsible have been sacked. 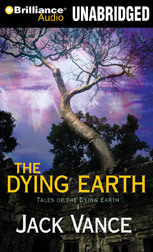 “Turjan of Miir” is the first story in Jack Vance’s The Dying Earth. It’s a densely rich story – when my mind wandered, I had to stop and back up the audio because each and every word is important and very much worth hearing. And a pleasure to hear, too – kudos to Arthur Morey for the fine narration. The story opens with Turjan trying to feed his latest creation. Turjan sat in his workroom, legs sprawled out from the stool, back against and elbows on the bench. Across the room was a cage. Into this, Turjan gazed with rueful vexation. The creature in the cage returned the gaze with emotions beyond conjecture. It was a thing to arouse pity. The creature won’t eat, though, and dies in front of him. Out of frustration (for he’s attempted to create life many times before), he decides to visit an otherworld where a man (or ex-man) named Pandalume will be able to help him stabilize the pattern he needs to successfully make life. Vance is luxurious with detail. In very little space, he tells us how Turjan can only carry four spells at a time, so for the trip to the otherworld he takes “three spells of general application”. The Excellent Prismatic Spray, Fandale’s Mantle of Stealth, and the Spell of the Slow Hour. It’s marvelous. There are many descriptive gems here. I immediately see how The Dying Earth spawned an RPG, and I can also see that Wolfe, Zelazny, and Gaiman were all influenced by Vance. The Time Traveler Show Podcast # 9: Features Sam Mowry & a Jack Vance short story!